Junior guard Shizz Alston Jr. leads the Owls into the 2018-19 season. 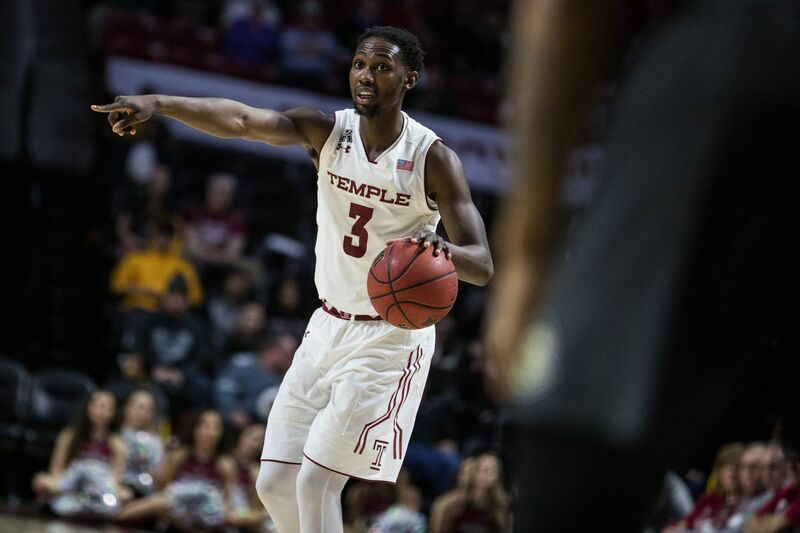 Temple's American Athletic Conference men's basketball schedule was released on Wednesday and the Owls will open conference play with two games on the road. Unlike previous years when Temple would open its AAC schedule in late December, this year's conference schedule doesn't begin until January. The non-league schedule was previously released so now the dates are set for the entire 31-game schedule. Some of the game times are still not known, dependent on television considerations. The Owls are coming off a 17-16 season in which they earned a berth in the NIT, losing at eventual champion Penn State, 63-57 in the first round. Temple figures to be among many teams from the AAC that have a legitimate chance to contend for an NCAA berth. The Owls return their top two leading scorers, junior swingman Quinton Rose (14.9 ppg.) and combo guard Shizz Alston (13.3 ppg.). The season opens on Nov. 6 when La Salle visits the Liacouras Center In a Big Five game. Tuesday Nov. 6 La Salle, 7:30 p.m.
Tuesday Nov. 13 Georgia, 7 p.m.
Saturday Dec. 1 at St. Joseph's 5:30 p.m.
Wednesday Dec. 5 at Villanova, 8:30 p.m.
Wednesday Dec. 12 UMass, 7 p.m.
Saturday Dec. 22 at Drexel, The Palestra, 1 p.m.
Wednesday Jan. 2 at UCF, 7 p.m.
Sunday Jan. 6 at Wichita State, 4 p.m.
Wednesday Jan. 9 Houston, 7 p.m.
Saturday Jan. 12 USF, 2 p.m.
Wednesday Jan. 16 at ECU, 7 p.m.
Saturday Jan. 19 Penn, 5 p.m.
Thursday Jan. 24 Memphis, 7 p.m.
Thursday Jan. 31 at Houston, 7 p.m.
Wednesday Feb. 6 UConn, 6 p.m.
Wed. Feb. 13 SMU, 7 p.m.
Saturday Feb. 16 at USF, 6 p.m.
Tuesday Feb. 26 at Memphis, 9 p.m.
Sunday March 3 Tulane, 2 p.m.
Thursday March 7 at UConn, 7 p.m.
Saturday March 9 UCF, 4 p.m.